The Sasol South African senior men’s wheelchair basketball team’s recent 76-37 victory over the All Star Invitation team in Johannesburg sees them a step closer towards completing their preparations for the International Wheelchair Basketball Federation’s African Qualifiers. With just over a month to go until the Sasol Amawheelaboys travel to Algiers, Algeria, in a bid to win the tournament which will allow them to represent the continent at the 2016 Rio Paralympics, national head coach Franck Belen is confident that progress is being made. ‘The national team has changed a lot since the previous African Qualifiers held in Angola in 2013, where the Sasol Amawheelaboys went down to Algeria in the final, and the presence of a lot of new young players has added a new dimension to the squad,’ said Belen. 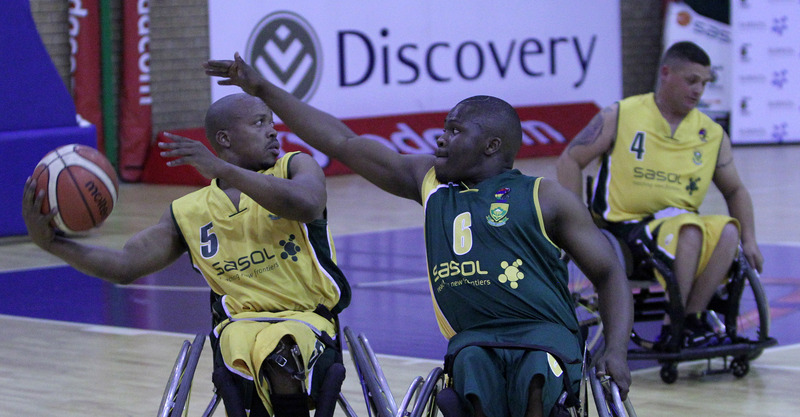 Belen expressed his gratitude to Sasol and Wheelchair Basketball (WBSA) for putting the four-match Sasol Green vs Gold Series in place to allow the players the additional opportunity of playing together as a team outside of regular training camps. ‘The Sasol Amawheelaboys have just come out of a 5-0 Sasol All Star Series triumph over the New Zealand Roller Blacks, and while I would have preferred for our team to have played against a slightly stronger line up in preparation for Algeria, the Sasol Green vs Gold Series allows for an additional preparation platform,’ said the coach. The Sasol Amawheelaboys have a final training session next month, which includes the fourth leg Sasol Green vs Gold Series match at Mandeville on 25 October, before flying off to the African tournament from 31 October-7 November.